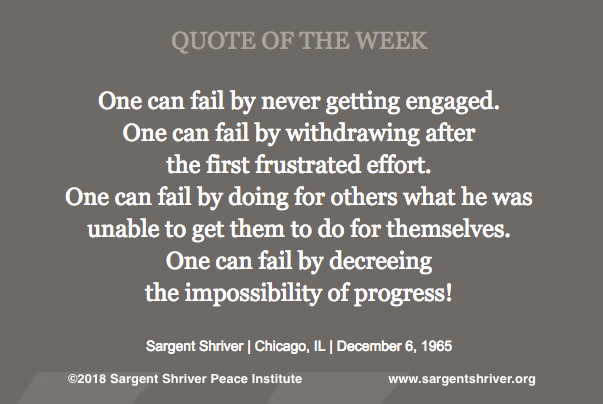 Our Quote of the Week gives us an insight into Sargent Shriver's notion of failure, which, by implication, also gives us a view into his definition of success. Sarge said these words while he was leading both the Peace Corps and the War on Poverty, two major presidential initiatives (the first of Kennedy's, the second of Johnson's) that each brought major challenges and significant opportunities for his own career and for the country as a whole. The fact that both of these initiatives spawned agencies that continue to function today, after over 50 years and through the administrations of 10 US Presidents, is an indication that Sarge's notion of success is one worth adopting. Sargent Shriver spoke these words at an anti-poverty conference in Chicago, Illinois. At the time, he was grappling with the complexities of establishing several poverty programs. Some, like Head Start, had proven to be wildly successful, while others, like Community Action, had been challenging to establish. The variety of programs, some popular, some not, struggled to grow, for a variety of reasons. Sarge stressed that for the programs to be successful, people had to put aside their judgments about the poor, put aside their judgments about the establishment, and they had to not be afraid to make mistakes. "Criticism, experimentation, and even mistakes are what make democracy work," he said. Turning Sarge's definition of failure on its head, for Sarge, success required engagement, persistence, respect for the autonomy and dignity of others, and a deep belief in progress. What about you -- how would you define failure, and how would you define success? Which characteristics or attitudes are essential for success, and which make failure more likely?